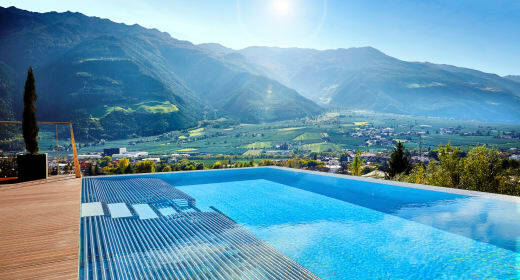 Holidays at the cosy Dolce Vita Spa Hotels in South Tyrol are an unforgettable experience. Have a look at the hotel brochures and dream of your next holidays in the north of Italy. Bring a piece of holiday fun to your home and let the pictures and information from South Tyrol inspire you. Experience times the holiday fun at your Dolce Vita Spa Hotels in South Tyrol: Hotel Lindenhof, Hotel Preidlhof, Hotel Jagdhof and Hotel Feldhof. Five times wellness & spa delight, five times 'Dolce Vita' feeling and five times indulgence at the highest level: your wellness & spa or activity holidays at your friendly hotel in South Tyrol. Are you looking for specific information on an individual hotel or about the first certified organic cosmetics line, BERG cosmetics, exclusively available at your Dolce Vita Spa Hotels in South Tyrol? Why not download the desired information right away?